Supersonic fighter-bomber aircraft of variable geometry wings. 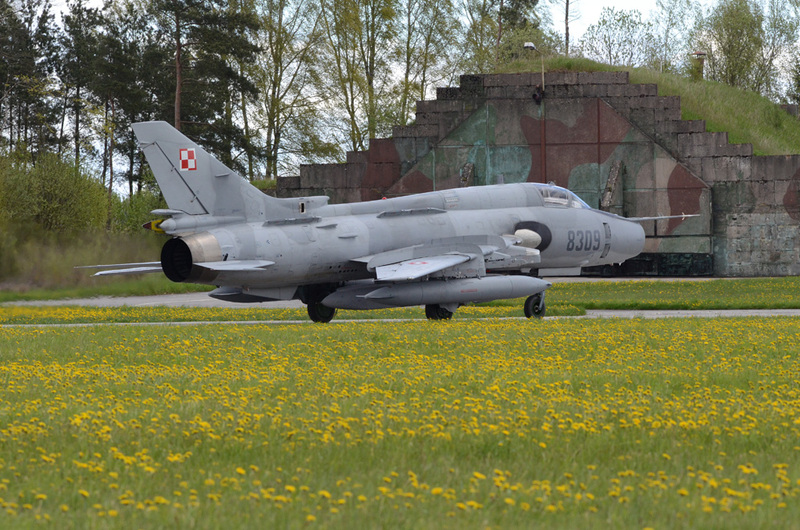 The Suchoj Su 22 Fitter introduced the Polish air force to the third generation of jets. The aircraft features the PrNK type targeting/navigation system coupled with CVM 20-22 central control computer and gyro-stabilized platform, which vastly improves the aircraft’s navigation and attack capabilities. 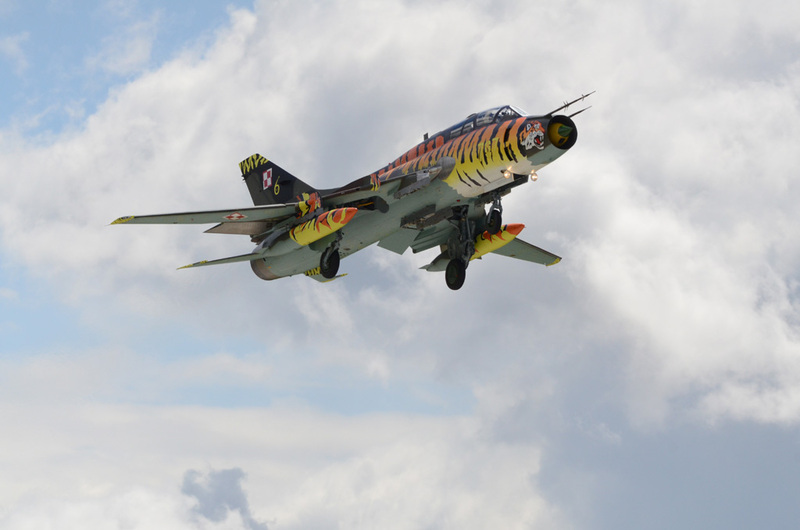 Su 22 was the first aircraft in the Polish air force to possess the capability of target detection without ground visibility thanks to the Klon-54 type laser designator (for targeting guided missiles) which is mounted in the front part of the fuselage. 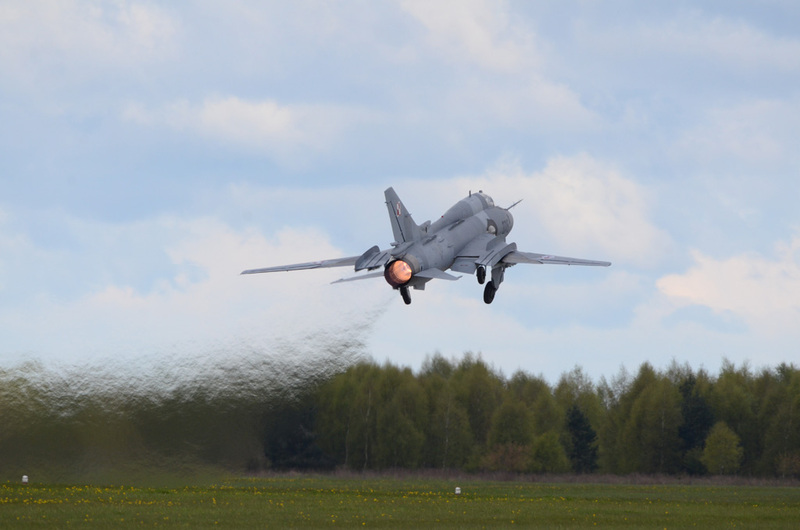 Su 22 is propelled by a single turbo-jet engine Lyulka AL-21F3 (S version). The first deliveries of Su 22 to Poland commenced in 1984. Purchased in the then Soviet Union, the Su 22M4 were the export version of the Russian Su-17M4. 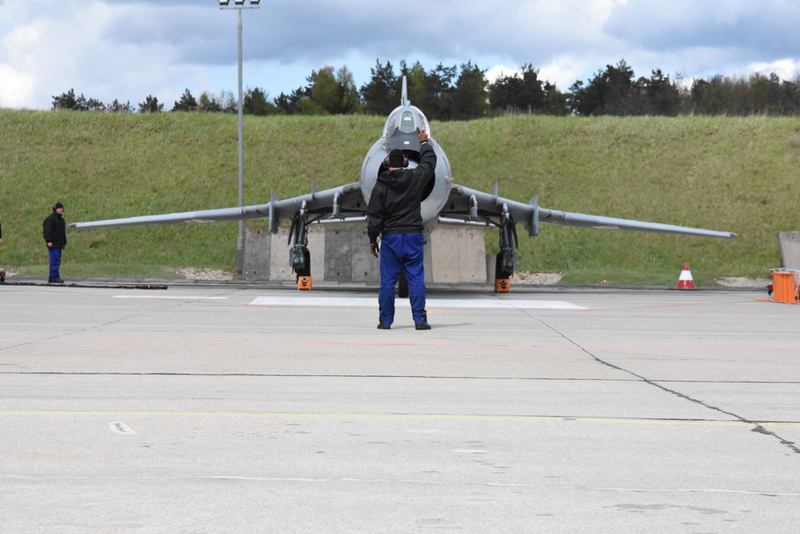 The aircraft were issued to the units stationed in Powidz and Pila. Those aircraft considerably augmented the combat power of the Polish air force. 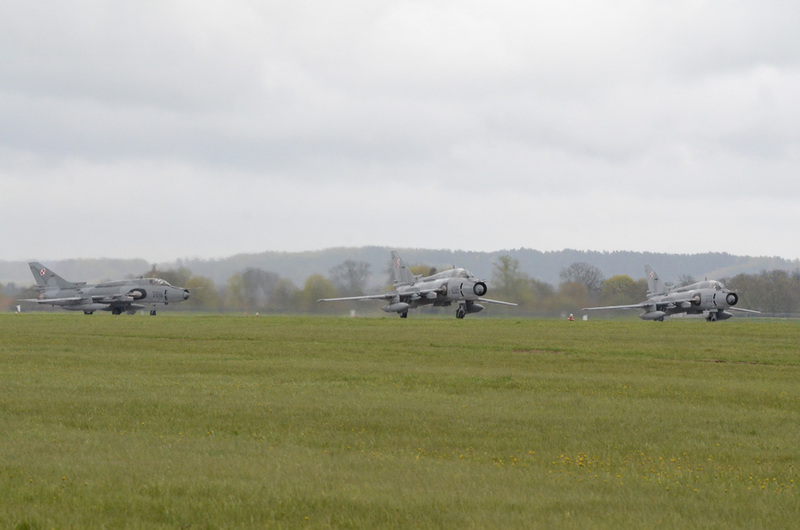 With the arrival of the first batch of 13 Su 22M4 and six Su 22UM3K , the Polish airfields had to be modernised and groundcrews trained to deal with the modern and much more complex design. By 1988 Poland received a total of 90 Su 22M4 and 20 Su 22UM3K, which remained on strength of four fighter-bomber Wings, based in Pila, Powidz, Miroslawiec and Swidiwin. 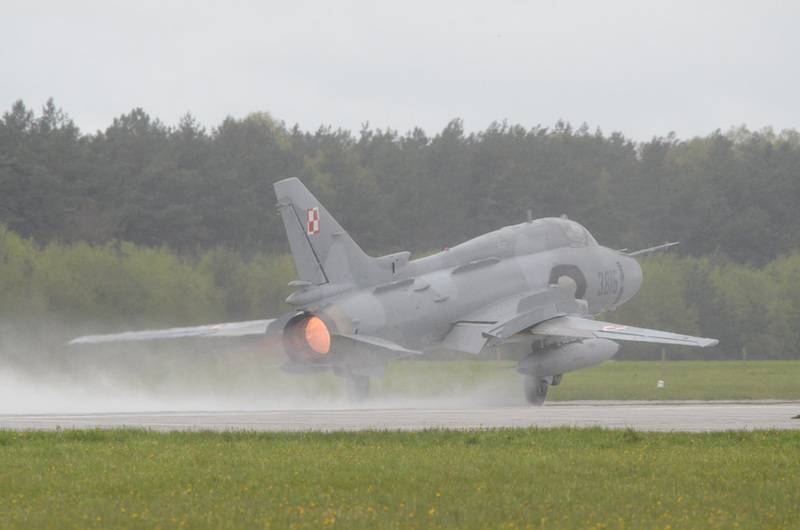 In the Polish air force the Su 22s fleet fulfils the role of ground attack and Close Air Support (CAS), reconnaissance and support to naval forces and ground Special Forces, and the sturdy airframes and the mighty and reliable engine make the Fitter particulary suitable for these roles. 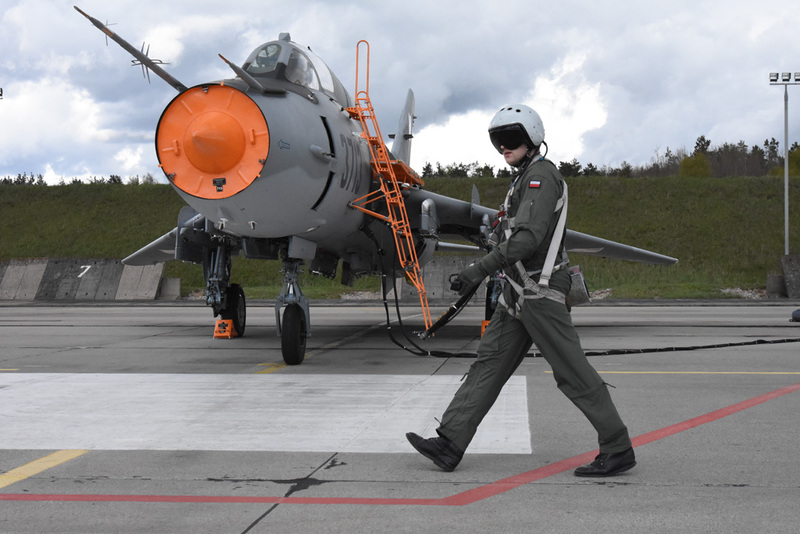 When Poland joined NATO in 1999, some upgrades were deemed essential, so as to enable their cooperation with other air forces of the pact. 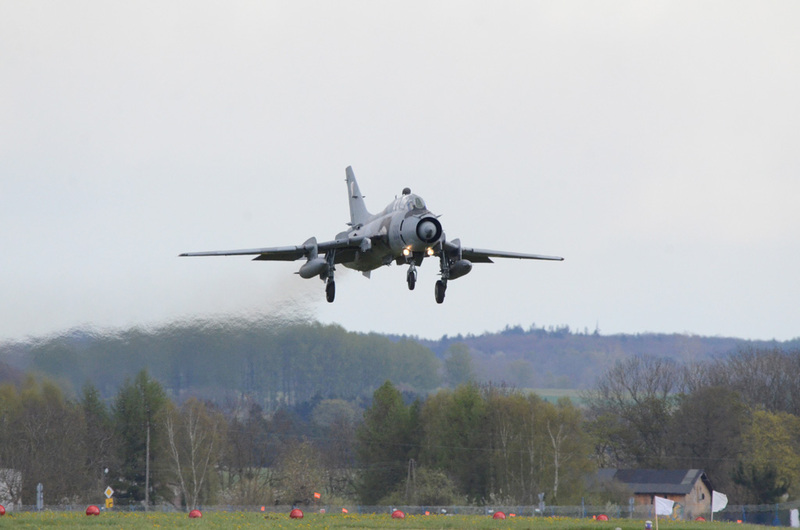 The aircraft were fitted with radio transponders, a friend-foe identification system and in accordance with NATO requirements, anti-collision lights. After the retirement of the Su 22 by the other european users, as Russia, Hungary, Bulgaria, East-Germany, ex-Czechoslovakia, the efforts of Polish ground crews to keep the machine in condition of efficency, are very high demanding. Swidwin remains the last Fitter’s base in Europe. It is home of 21 BLT (Baza Lotnictwa Tacktycznego) and it is composed by 8 ELT (Escadra Lotnictwa Tacktycznego) and 40 ELT, both equipped with Su 22M4 and UM3K. In Poland the most important Unit is the Air Base, more than the squadrons which are hosted in it, and the base is hardly bound to the city/town where it is placed. Swidwin is home of 21 Baza Lotnictwa Taktycznego and its emblem is rappresented by the castle of the city and two Fitters. 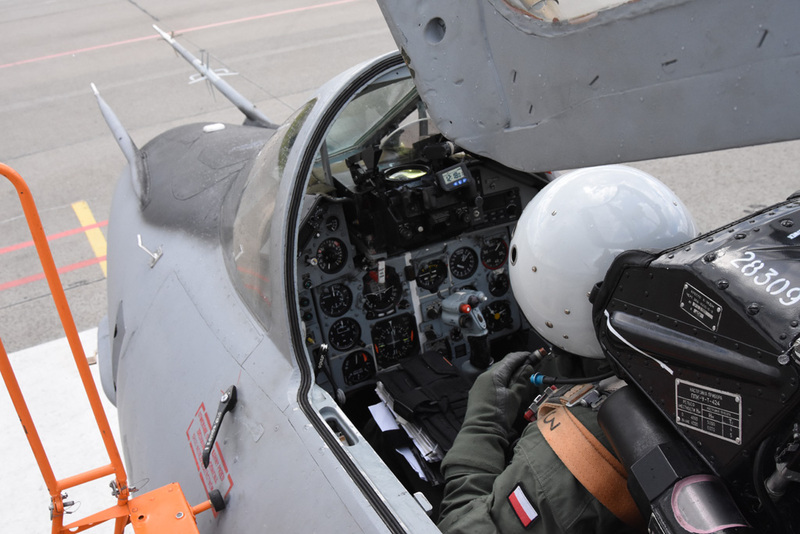 The main roles at the 21 BLT are anti-surface strike as part of defensive operations, reconnaissance, training for the new pilots assigned to Su 22 Fleet, supporting units of Polish Land Forces, Navy and Special Forces. 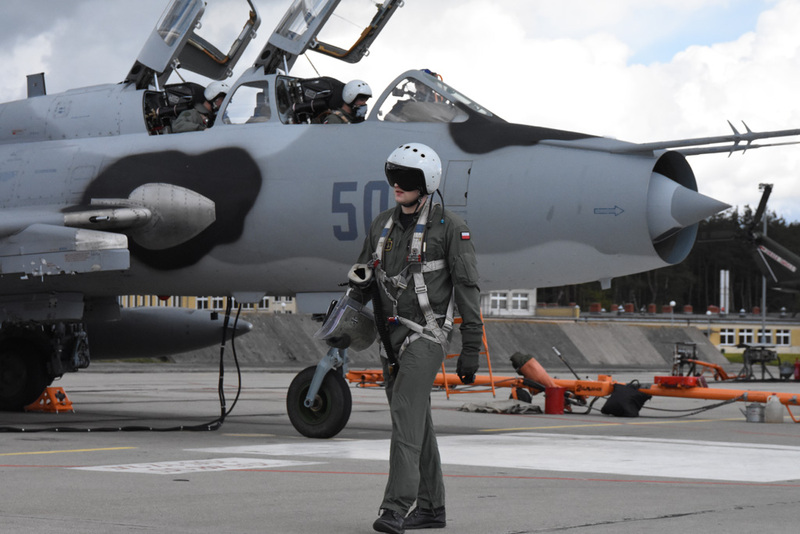 Among Swidwin new pilots coming from Deblin flying school begin their training on Su 22, after learning basic flight on PZL-130 Orlik and operative flight on TS-11 Iskra, as 2LT Kamil Blaszczyk tells, they arrive to 21BLT where they are supposed to fly 70-100 hours per year, for becoming combat ready after 500 flight hours. 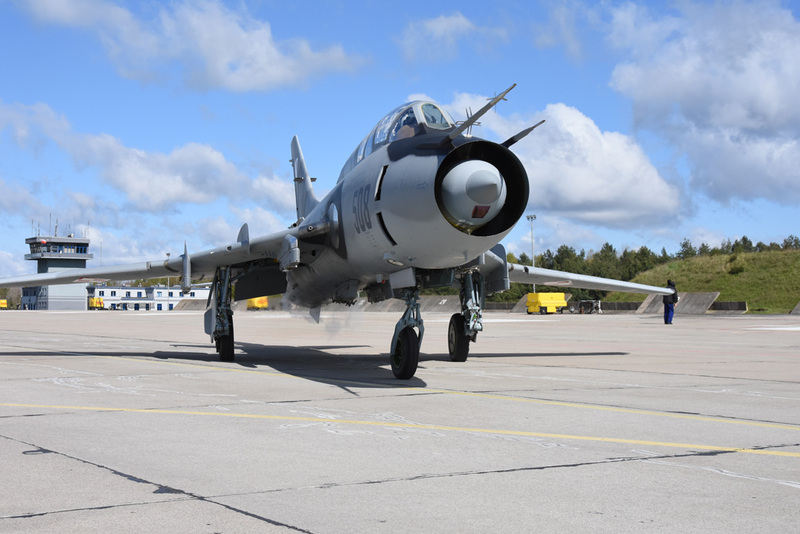 Firing exercise are carried out periodically on Ustka and Drawsko firing ranges, not far from the air base, in a rural area with low density of population, well suitable for low level flights. 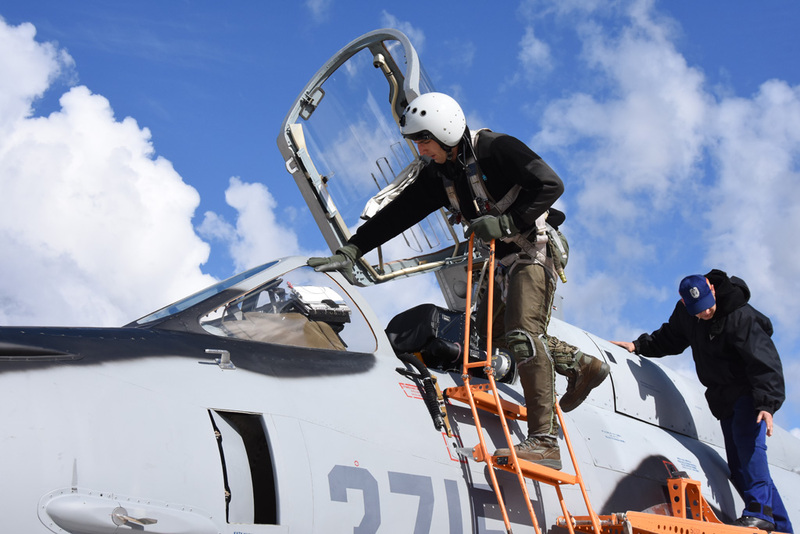 Setting NATO, the Pols Su 22 take part to joined exercises frequently. Recentely, as Maj. Pil. Grzegorz Pirog explains, they partecipated to Kevadtorm (Spring storm) 2017 exercise in Estonia, where the Pols Su 22 fulfiled CAS missions co-operting with Polish and Estonian Army. The exercise was useful for familiarizing with other allied forces, with operational procedures and the standard decisions to be taken during a mission, for enhancing the interoperability with other NATO forces and it was a great oportunity for young pilots to train in a high demanding scenario. By the way, compared to earlier Soviet cockpit designs, which were ergonomic nightmares, the Su 22’s pilot station is roomy and designed to facilitate the pilot’s job. Visibility was largely improved, as one pilot dscribed his first impression as “sitting on top of a barrel high above the ground”. Anyway, main instrument panel layout is much clearer compared to earlier types with flight and navigation instruments left of the white centerline. The wing sweep angle indicator is partially visible left of the gunsight, while its selector switch is further to the left. Below it is the SAU control panel, the white undercarriage/flap emergency release handle, an armament control panel, the landing gear/flap/airbrake position display, the landing gear control handle and the nose wheel steering angage switch. Right of the white centerline are engine monitoring gauges and some more flight instruments as well as the nose cone and spill door position indicator. Fuel control instruments and hydraulic pressure indicators can also be found here next to the master caution panel. The combiner glass of the ASP-17BCE optical gunsight has different settings depending on weapon delivery mode but, unfortunately, it does not work automatically in connection with the weapon selector panel. An array of indicator lights on the windshield frame informs the pilot of a missile lock. The right sidewall features an armament display panel, two indicators for the NR-30 cannons and a center indicator for the SPPU gun pods when installed. Below the red canopy emergency jettison handle are the main switches for the systems: tester U-3, SPO-10, ejection seat pyrotechnic cartridges, DISS-7, RV-15, UUAP-72-M-7 angle of attack and accelerometer, ARK-15M, ANV-241MMR, MRP-56P, V-141VMGKE, aiming system, SAU-22M1, SO-69 and SRO-2. The cockpit pressurization/air blast system control switch is also on the right, allowing the pilot to switch for oxygen in case of bird ingestion. The DISS-7 Doppler radar is located ahead of the nose wheelwell bahind a green dielectric panel. The forward dish emits four beams at known frequencies to the ground. As they are reflected back to the rear dish, the frequency of the forward beam increases while those of the rear are reduced in proportion to the speed in any direction. The onboard V-144 computer analyses the frequency shifts and determines the speed of the aircraft and the angle of drift. Finally, it provides the necessary data for the aiming, IKV, SVS and ANV systems. The RV-15 radio altimeter aerials are forward and aft the Doppler radar. The main pitot boom is positioned on starboard side and consists of a PVD-18-5M pitot head, pitch and yaw vanes and the ANV-241MMR. The auxiliary pitot tube is on the left. Passing Mach 1.35, on M3 and UM3K versions, the adjustable nose cone slides forward, detaching the oblique shock and restricting the intake area, all controlled by the ESUV-1V system in accordance with speed and engine air consumption. This system even opens the earlier suction doors, this time outwards to release excess air from the intake duct after the cone reached its most forward position. The M4 version does not have a sliding cone, that’s why it has “less” speed then the UM3K. As Maj. Jakub Pielak, experienced technician, explains, maintaining the Su 22M4 is easier than safekeeping earlier Soviet aircraft such as the MiG 21 or MiG 23, despite the presence of more complex systems.This because these systems are pratically grouped and easly accessible, and the use of modular units and automated diagnostic sets. Mainteinance philosphy remained unchanged, with 100, 200 and 400 hours scheduled airframe inspections instead of “on condition”overhauls. Additionally, periodical check-ups are performed every 60 and 120 days. But every 50 flight hours is expected a “quick” engine check. The Su 22 has two separate hydraulic systems located in differnt places, to reduce vulnerability. One system is on port fuselage side and operates flightcontrol boosters and wing sweep control systems. The second system is on starboard side and operates the undercarriage, nose gear swivel system, automatic braking of the main wheels during retraction, air brakes, flaps, slats, rudder, nose cone travel, spill doors, flight control/wing sweep control systems. The sturdy undercarriage was constructed to withstand heavy landings either by inexperienced pilots or on unprepared landing strips. Their strength was proved once when a pilot, turning for final approach over the fence at tree top level, selected afterburner to prevent loss of speed. This acceleration made him overshoot the treshold at 400km/h instead of the indicated 280km/h in a “down and dirty” configuration. Additionally, he deployed the brake chute (not permitted above 320km/h) and pulled back the stick to reduce descent. This resulted in a steep 8m climb which made the aircraft stall, followed by a severe loss of speed which made it hit the runway from a 5m altitude, bouncing several times on impact. Finally, the aircraft stopped having travelled a few hundred meters down the runway, only demaging its ventral fin. The Su 22’s weapon inventory is very large, as Maj. Piotr Pograniczny explains. Above the starboard NR-30 type cannons with 80 rounds per each, it can carries the H 25ML laser homing air to ground missiles, which can be launched at altitudes of 100 meters up to 5000 meters and has an effective range of 10km, R-60 missiles, a salvo of 32 S-5 type folding rockets can be fired from the UB-32 launcher, of which six can be carried on the inner and outer wing pylons and forward underfuselage stations, the huge S-25 unguided air to ground missiles, the S-24 unguided air to surface missiles, the SPPU-22-01 gun pod houses a pivoted GSh-23L twin barrel cannon and 260 rounds of 23mm. Four of these cannons can be mounted on Fitter’s pylons, and they can be mounted in the direction of firing to the backwards of the aircraft. The Su 22 is capable of carrying any knds of bombs, ranging from smaller practice bombs, like P-50-75, to FAB 100, FAB 250 and FAB 500 heavy bombs. For active ECM protection in a high threat environment the Fitter can be equipped with the V-141 pod,which produces interferences and falsificates the position of the aircraft on enemy radar, and an UB-32 rocket pod is carried symmetrically for aerodynamic balance. The KKR-1TE/2MK reconnaissance pod can be carried on underfuselage station. It accomodates a battery of three cameras, the A-39, the PA-1 and the UA-47 for night images. 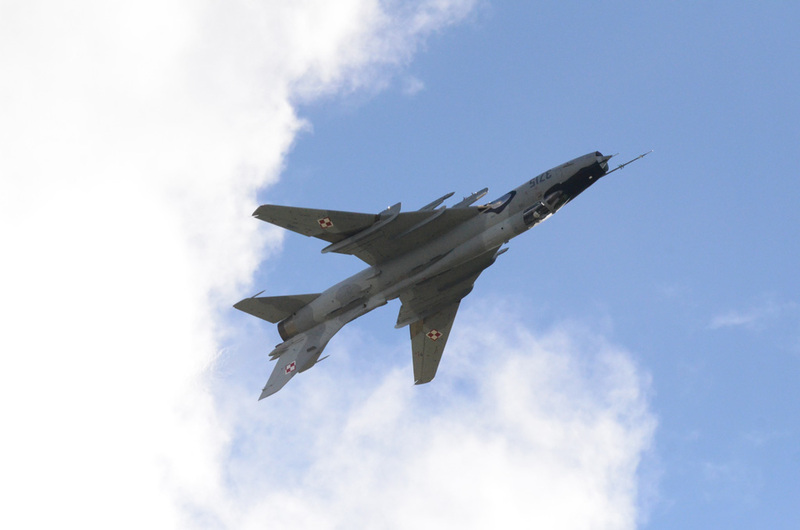 Considering that the Sukhoj Su 22 has a very reliable engine, it requires an easy mainteinance and the Polish technicians are particularly experienced in it, and even the Su 22 is the only fighter in Polish inventory which can provide electronic warfare, and it presents less malfuncition if compared with the other Polish fighter as MiG 29 and F 16 Block 52+, the Sily Powietrzne (Polish Air Force) capitalized a lot of its efforts on the Fitters fleet with the aim of keeping it alive as long as possible, even because the cost of its mainteinance was lower then to buy a new fighter to replace them. The lack of spare parts is overpassed by the big stock of old Fitters which rappresent a source of vital parts, and some of them are the same used by Su 27, so it is possible to ask to Ukraine and Belarus friends. 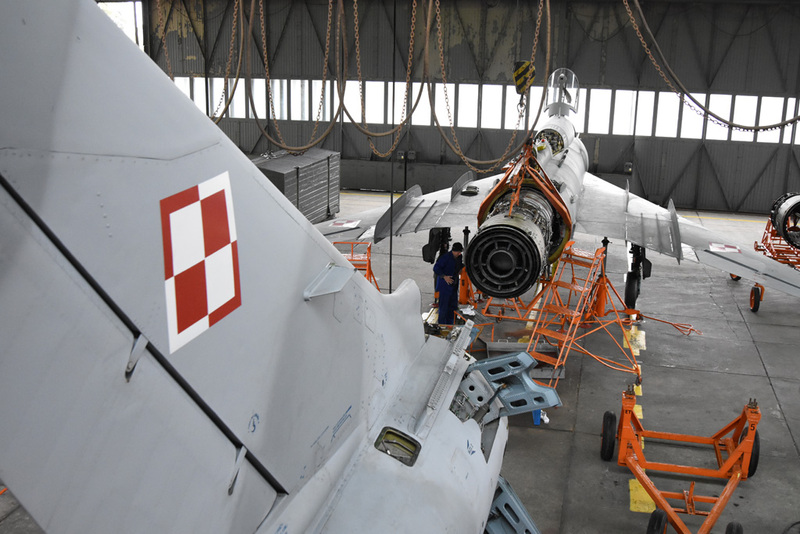 Furthermore, some electric parts with high turnover are produced by new by Polish facturies and adapted to the Su 22 by Swidwin’s technicians. However, for extending its operative life, it was necessary to undertake a further upgrade. Anyway, few years ago the future of the 32 remaining Su 22 was uncertain and pessimist, due to an official statement released on 2014 where the plann showed was to retire the Fitters in 2016, and replacing them by secon-hand F 16s. 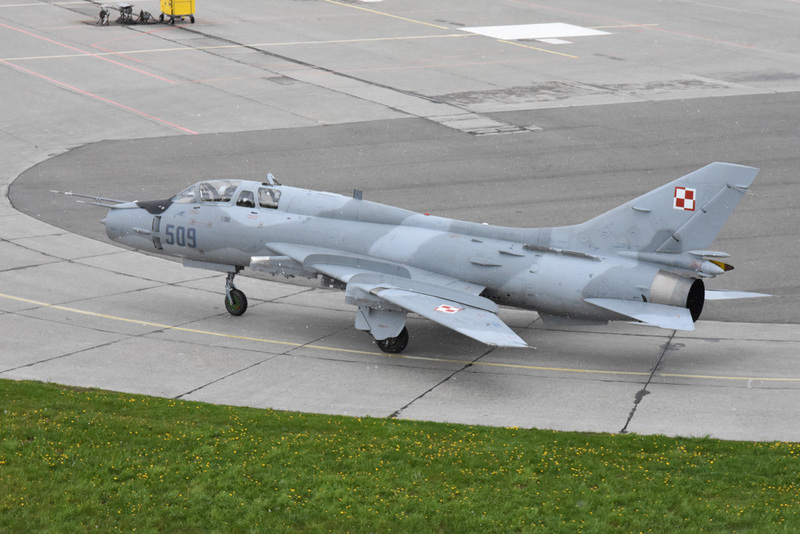 But few months later, the good luck helped the Fitter’s destiny, and in April 2015 the Polish Ministry of Defense announced the appropriation of 36 million of Euro for a minor upgrade to 18 machines, and thanks to this, the life of this 18 Su 22 was extended till 2024. The upgrade started on 2015 and it provided to prepare six machine per year till 2017, when the upgraded fleet of 18 Fitter would be operative. 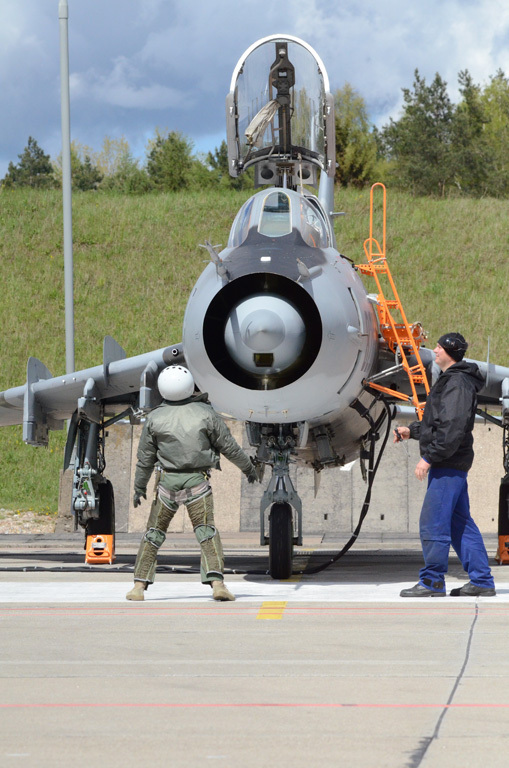 The 18 examples were overhauled by WZL-2 (Wojskowe Zaklady Lotnicze No2- Military Aviation plant-2) in Bydgoszcz. Those aircraft that are not going to be upgraded, will be retired in 2018, but there is the aim to convince the Governament to allocate further money for the upgrade of additional six aircraft, due to the need of a bigger fleet and to the perfect conditions of those six aircraft, as Col. Karol Jedraszczyk, Comander of 21 BLT, explains. The equipment to be installed includes an RS-6113 radio and a new flight parameter ecorder, new cockpit instrumets scaled in the imperial system replacing all the metric-scale gauges. The most important upgrades includes a Trimble 2101AP GPS receiver, Bendix/King KLU-709 Tactical Air Navigation (TCAN) system, anti-collision lights, ANV-241MMR instruments landing system (ILS), R-862 digital control panel radio station and an ATM QAR/S-54 to display flight, navigation and weapons system information. But not everything in the original Su 22 was to throw away, as friendly Maj. Pirog tells us, becuse he personally prefered the soviet PRMG instead of new ILS. With this new changes and overhoul each Su 22 is able to flight 80 hours per year for the next 10 years. Of course if the needs will lead to exceed the expected annual flight hours, the expected life will be reduced. Although this important MLU-upgrade, the cell of Su 22 is becoming obsolete, and it is difficult to believe in the rumors which say that few Su 22 can stay in service even above the 2024. 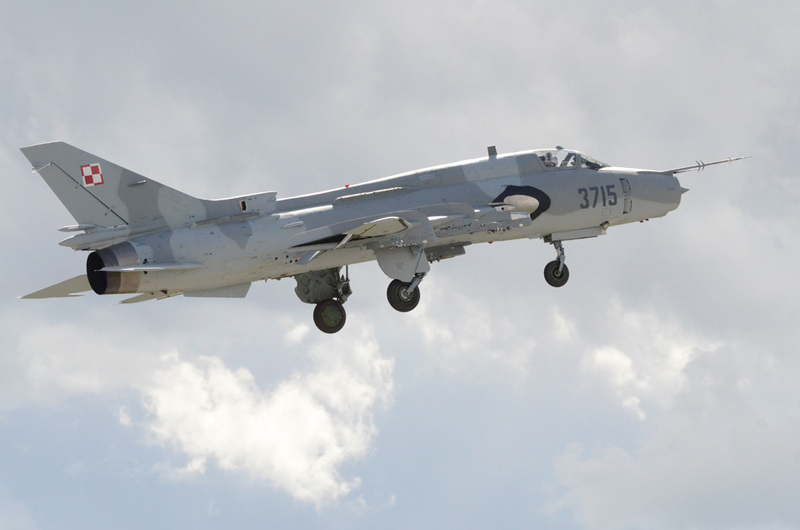 The great job of WZL-2 and Swidwin’s technicians allows further use of the Fitters, but the modernization will not provide the Su-22 with the NATO required combat capabilities. Many pilots of 21BLT are enthusiast by the remarkable reliability of the Fitter, particulary resistant against FOD (Foreing Object Damage), mostly if compared with IV Generation aircraft. The engine is old, but still mighty and reliable, and the rugged airfoil is particulary adapt for CAS operations. But the future is to have a single multi-role aircraft for the entire Air Force, so all the pilots and technicians will be interchangeable from a squadron to another looking to the needs. So in October 2016, Polish MoD spokesman declared in an official press interview that Poland is looking at the option of ordering another batch of F 16s to replace the Su-22 and the MiG 29 with a single multi-role fighter from 2022, capable of operating in every weather conditions in co-operation with NATO allied Forces and in full cohesion with NATO systems. But the current budget limitations and progress of other military programs can make those date, the 2022, to be re-evaluated.